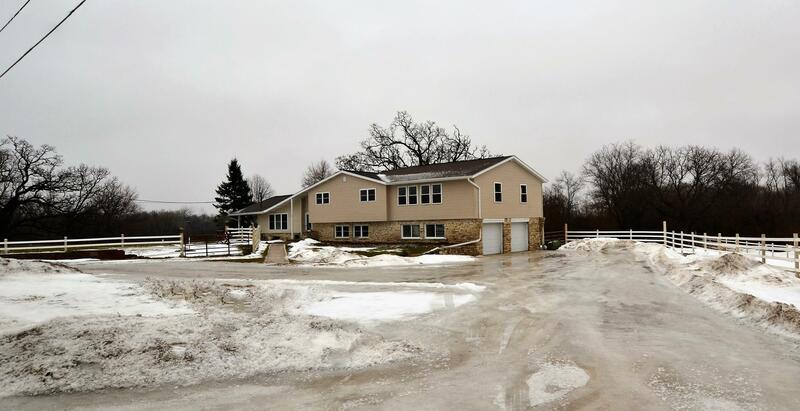 Why build when you can move right into this nearly brand new tri-level on 1 acre lot?! Newer roof, windows, plumbing, boiler w/3 zone system, well pump & pressure tank, septic mound system, water heater, fresh paint & brand new family rm addition. Main flr boasts open floor plan w/spectacular wood burning fireplace in living rm, kitchen w/an abundance of cabinets and countertop space & dining rm w/slider doors to the covered patio perfect for summer entertaining. Upper level offers full bath, 2 spacious beds, master suite complete w/full bath & an enormous family rm. Lower level offers another bed, full bath & rec rm complete w/ radiant floor heating. PLUS this home has a basement w/an exterior door to the outside. Outdoors has plenty of space for your pets & family! Come take a peek!